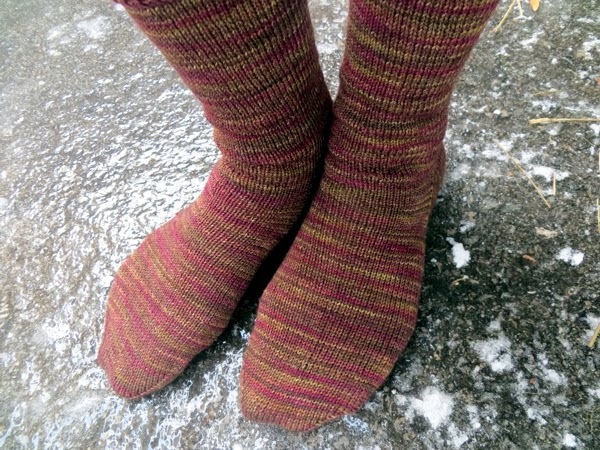 Photographing handknit socks is an adventure in thinking of new stuff to say. If you photograph socks a lot, that is. 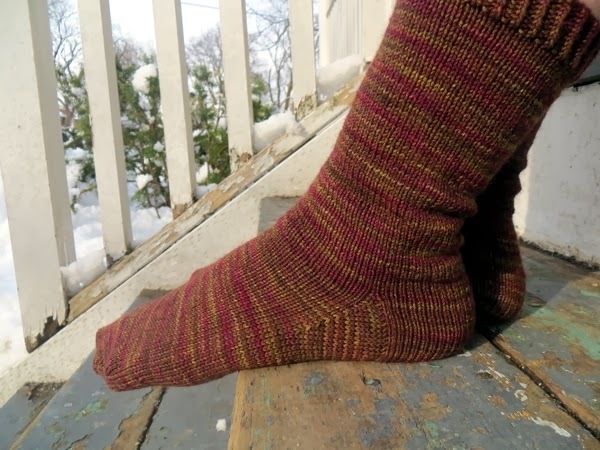 Speaking of which, I photograph finished handknit socks beyond a lot, and boy is it embarrassing to do that on the front porch while people are walking past along the sidewalk. Seriously, the ones who aren't actually my neighbours and don't know me must think I'm crazy. My neighbours on the other hand are well versed in the crazy. But to get back to my point: once you've exhausted every conceivable way to pose a pair of socks without traveling to some particularly scenic place that is, frankly, not my porch - or will not be my porch in the spring when we replace this rotting, peeling version (oh how I will miss the rustic, photogenic one when I am walking up stairs that are not disturbingly soft and squishy) - sock photography gets a bit silly. I mean, I knit most of them to exactly the same totally plain pattern and everything. 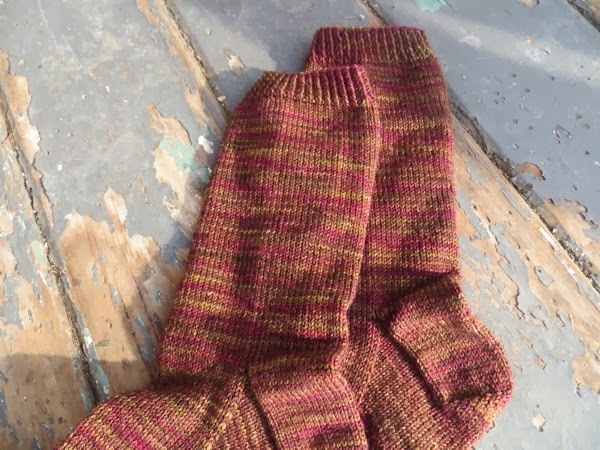 The only variation is yarn colour, have you noticed? You've probably noticed. 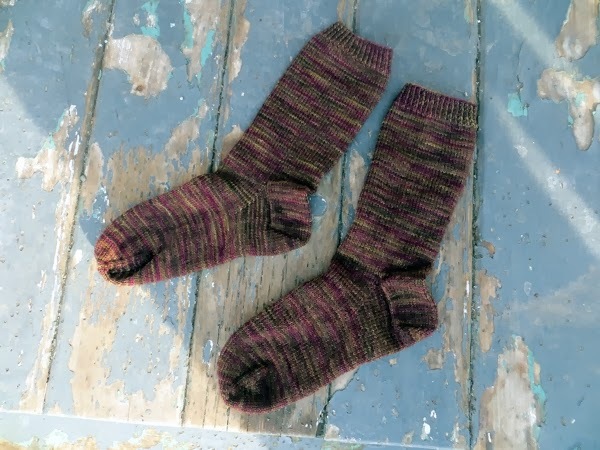 Actually I'm amazed you're even here looking at these handknit socks after all this time, and just a little flattered. These socks though - they are special. 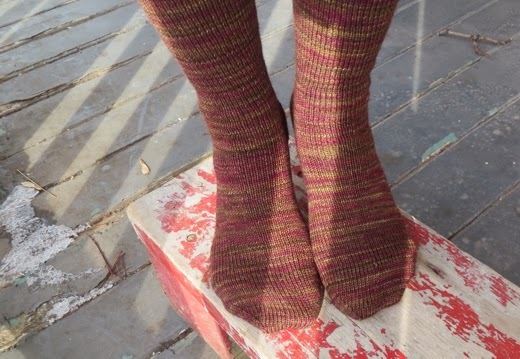 Normally I can get four or five attractive sock pictures out of the 25 that were taken, but these ones? It was so cold and snowy out I could only face taking a dozen, and they were all fantastic. I pared them down so your eyes wouldn't glaze over completely and inspire you to doze off, sliding off your chair and possibly hurting yourself in the process. 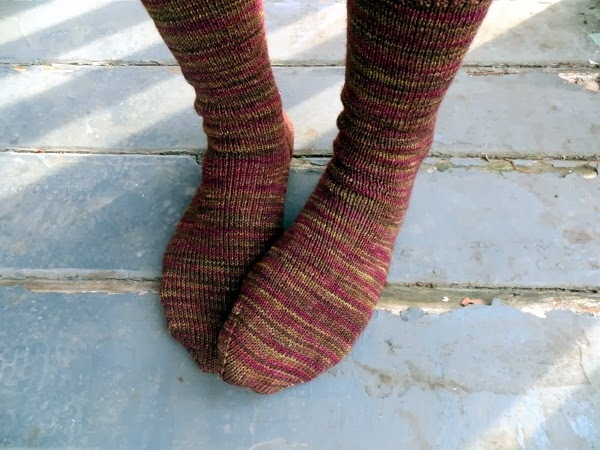 Except that wouldn't happen because these are easily the most photogenic socks I've ever made - and wouldn't you know, they're the Viola yarn ones? The ones in yarn I can't get any more, because Emily stopped dyeing small-batch yarn in favour of England and textile study. Okay, I don't blame her, but now that I finally have the courage to be knitting with my Viola I'm wishing I'd bought a ton more than I did. 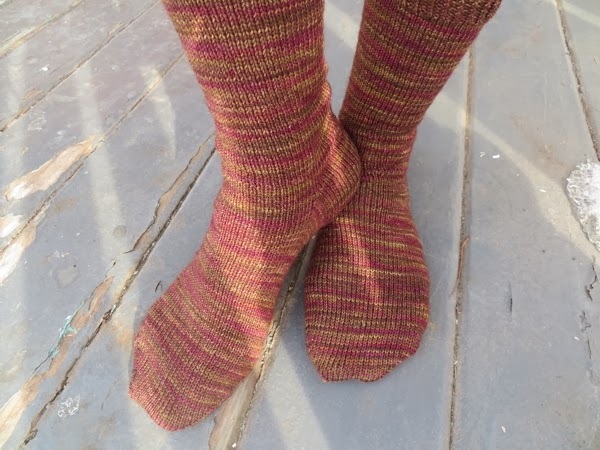 They're a little snug because the yarn is a bit finer than what I usually knit with, and I used needles slightly smaller to match, and it never occurred to me that this might produce something a little narrower through the bend. Do I care? Of course not. It's Viola. The only shoes I have that really do these things justice are some velvety suede flat Oxford things suitable only for completely dry and dust free weather - there must be highly fashionable women in this world who rarely if ever set foot into anything other than Dry And Sunny, because somebody went to the trouble to make these things - but in the end I decided not to put them on for the pictures because they would cover too much sock. Tired of looking at these things yet? Maybe just one more? Okay, I'll stop torturing you. Go have a good day, and knit something - I'm sure it will be beautiful too. You know how Julia Child's kitchen was taken apart and moved to the Smithsonian? 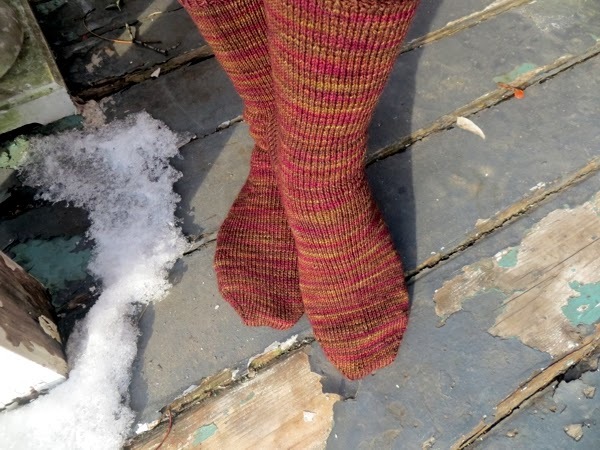 Maybe there's a sock museum somewhere that's meant to be the future home of your current porch! We could visit it, and have our picture taken with it, longingly remembering all the photos of sock-covered limbs for which it provided a charming backdrop.